Photo above: James S. Lester, DO, with his fellow 2015 Southern Regional AHEC Residents. 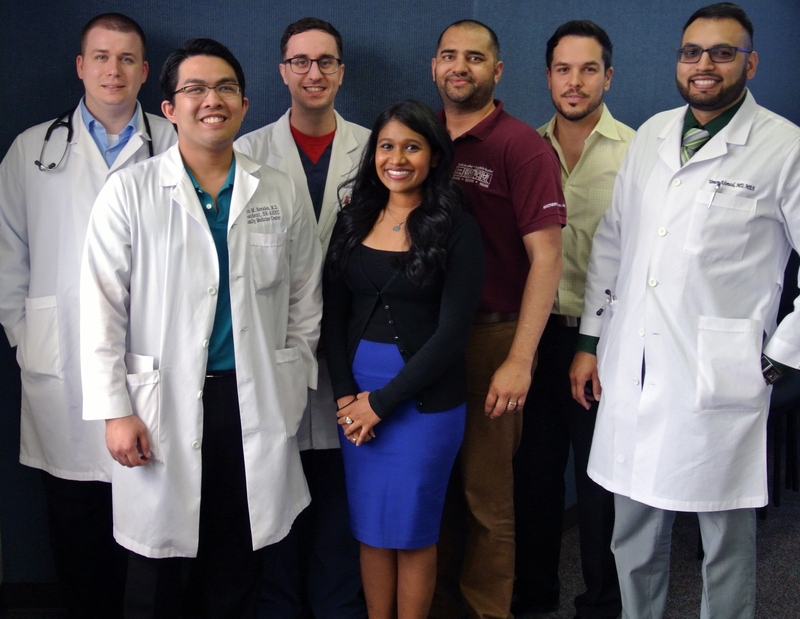 From left: John Novales, MD; Alexander C. Gelou, MD; Sandhya Manivannan, MD, who stayed at SR-AHEC as their first diabetes fellow; Suinder S. Bahia, MD; Aaron Pascual, MD; and Umer Ahmed, MD. When James Lester arrived in Fayetteville as a third-year medical student during late summer 2011, he had no idea that his first rotation would be the beginning of an incredible AHEC journey. That path guided the lanky, baby-faced doctor to progress from nervous student to resident leader, resulting in the confident osteopathic family physician who now serves a member of the core faculty team at Southern Regional Area Health Education Center. During the third year of his residency, Lester discovered that he enjoyed teaching. “And it was just by happenstance, when I was talking with Dr. Kapoor about how I liked teaching, that a lightbulb went off in my head—this was what I wanted to do,” he said, recalling his decision to stay after graduation as a faculty member in the Duke/SR-AHEC Residency Program. And his patients are happy, too. “I’m happy he is staying. He is a great doctor,” said the mother of one of his young patients. “When my two-year-old had a cut over his eye, Dr. Lester was patient, reassuring, and did well on his own,” she recalled. “But I also noticed that he took instruction well from his preceptor.” Now when she sees him, he also asks about her child. “So Dr. Lester’s good at following up, as well,” she said with a smile.